A couple weeks ago we shared some basic information on understanding and enjoying vermouths, and now, we are going to take our vermouth knowledge to the next level! Last week we attended an event focused on the history of negroni and aromatized wines, hosted by Bonvida Wines and Guilio Cocchi (KOE-kee). Guilo Cocchi was established in 1891, after the founder moved to Asti from Florence. Guilio was not only a distiller, but also produced sparkling wines. The popularity of Cocchi’s Italian aparitif grew quickly, exporting to Venezuela, London, Sydney and New York by 1913. Asti, in central Piedmont, is known historically for its vermouth production and aromatic wines. Inspired by history, Giulio produced his sparking wine based on Moscato d’Asti. We featured the Primosecolo on Tannic and WineCollective last year. The Primosecolo has been produced since 1991, when it was first created to honour Giolio Cocchi’s 100th anniversary. The Primosecolo is left for an extended period on the lees and undergoes extended secondary fermentation, a method referred to as “Metodo Italiano Lungo.” During the process the wine ferments in stainless steel tanks, rather than individual bottles and is then bottled under pressure. 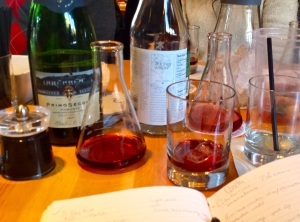 The Cocchi tasting at Bar C was not conventional. 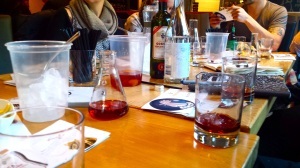 We were guided through an interactive mixology experiment, reminded us of junior high chemistry class. With beakers of brightly coloured vermouth and aromatized wines, we concocted different layers of flavours with basil, peppercorns, lemon peel and even Primosecolo. 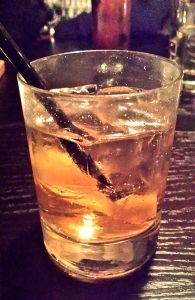 Vermouth is intended as an aperitif. It is to be enjoyed at the beginning of a meal to ‘open your palate.’ Depending on the style of vermouth, it is also fun and versatile to pair with different foods. We tried dates with the Cocchi Vermouth Amaro. Traditional Italian chocolates made with decadent hazlenut called Gianduja was perfect with the Barolo Chinato (KEE-nat-O). Get in touch if you have any questions about Cocchi and discovering the vermouth. 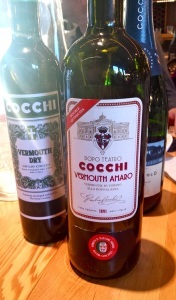 You can find the Cocchi Storico Vermouth di Turino at Highfield by WineCollective.